Chimneys: Chimneys in this area of Florida most commonly are constructed with wood frame or block. Typically they include a stucco finish that is painted. There are also frame and block chimneys that include a decorative finish of brick or stone. 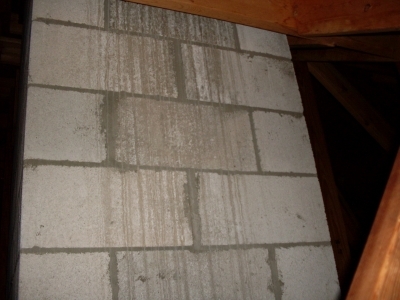 Based on the hundreds of chimney repairs we have done, 80% of the roof leaks were coming from the chimney structure. This should be a startling fact for anyone, so we want to state this again. Eighty per cent (80%) of the roof leaks we have repaired around chimneys have been a result of water infiltration from the chimney structure itself. The most vulnerable points of a chimney structure are all horizontal surfaces, whether the construction is of wood, or block & concrete. Wo od construction will suffer more substantially than concrete, but given enough time both will ultimately show up as a roof leak. The time span to spot evidence of a structure problem inside the house or from the attic is as early as five years, but more often upward to ten years. From our experience we can spot the early evidence as soon as a couple years from in the attic. However, we can view a structure that is less than one year old and tell you if sufficient measures have been taken to eliminate water infiltration into and through a horizontal surface. If you have a chimney, whether it can be accessed from the attic or not, you owe it to yourself to call us for a free inspection. Even within the first year, we can determine if your structure needs prevenetive measures, that could save you thousands of dollars, years from now. Elastomeric coatings: Do not be lured into the belief that one, or even multiple coatings of this material will alleviate this real, but so little discussed danger to the equity of your building. This product will not stand up on a horizontal surface for more than six months. 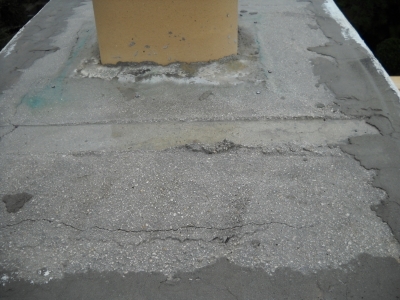 Water Infiltration: The 2 pictures at the top show what 17 years of the elements have done, and will do to a mortar covered concrete structure. 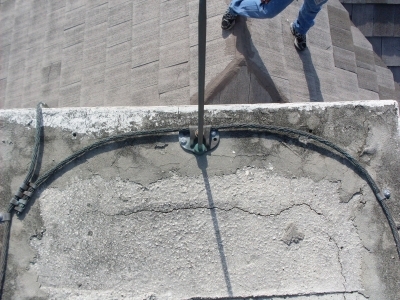 Although common knowledge in the construction industry that mortar and concrete are permeable, this chimney and all that we have worked on, were either completely neglected as the case of this structure, or in vain, painted with an elastomeric paint, over the horizontal (vulnerable) surfaces. The picture directly above shows water staining down the block, most frequenly misinterpreted by those not as knowledgable as ourselves, as a roof leak.